We’re happy to announce the addition of G1.ca to our eResource lineup. G1.ca offers free G1 & M1 practice tests to library customers; these tests have been developed specifically based on the official ON Ministry of Transportation driver’s handbook. Practice tests are available with corrective feedback, and also in simulator mode – which is about as close to the written test as you can get. Whether you’re prepping for the official test, or simply looking to brush up on Ontario’s road rules and signs, you’ll find the tools here. 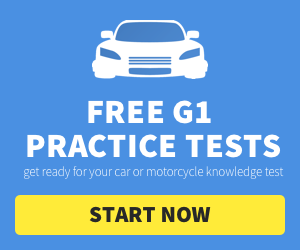 G1.ca also contains helpful information and FAQs pertaining to driver testing in Ontario. This resource can be accessed from the Windsor Public Library databases page under Special Interest.